January 3, 2019 - Senator Ben Cardin from Maryland introduced S.22, the Medicare Dental Benefit Act of 2019—a bill that, if enacted, would allow older adults and persons with disabilities to access their oral healthcare as they do their medical care—through Medicare. Read the full text of S.22 here. A balloon helps cheer up a child who just received a vaccine at the East County Health Center in Gresham, Ore. Starting last October, parents of children age 0-3 attending Multnomah County Dental Baby Day clinics are now asked if they would like to get their child up to date on vaccines they may be due for. Despite the possibility of more tears, around 100 children have been immunized with needed vaccines, ranging from Hepatitis A to influenza. The project, sponsored by CareOregon Dental, aims to improve care coordination and quality, and the overall patient experience. Multnomah County health centers, located in Portland, serve about 51,000 primary care patients; about 3,000 of whom are under age 4. An analysis of health centers’ data found that nearly 20 percent of children seen at the Baby Day program were not up-to-date on needed vaccines. This project will make it easier for parents to get children back on schedule, without making additional medical appointments. The goal for the end of the 2 year pilot project is to vaccinate 80 percent of the children eligible for vaccines. The Medical Assistant reaching out to parents offers vaccine education, and also attempts to schedule routine follow up primary care visits for children when she notices they are past due. The Dental Baby Day program provides a clinic-like setting where children are familiarized with the dental environment, screened for dental problems, and receive services from providers including oral health assessments and fluoride treatments. Parents receive oral health education and participate in goal setting on topics such as brushing, nutrition and bottle use. Immunizations are offered to all Baby Day patients who are established with a primary care provider at a Multnomah County clinic and who are missing necessary immunizations. Though it's sure to be a win for the Health Centers, the jury is still out on whether or not the littlest patients, who are now enduring tooth brushes and needles in the same visit, agree! Please contact Aron Goffin with questions at aron.goffin@multco.us. December 5, 2018 - Woodburn resident Dora Sandoval is Oregon's first community dental health coordinator! But the capacity in which she was visiting is a new one. In fact, it's so new that she is currently the first and only person in Oregon operating in that role. Sandoval, who graduated from Woodburn High School in the mid 1990s, is Oregon's first community dental health coordinator, or CDHC, described as a relatively-new and quickly-growing profession across the country. "I was in high school here 22 years ago," she recalled. "And my son was in (CLC) programs here five years ago. "This trailer is still the same as as it was when I had a "Child's World" class back in high school." The high school itself and much of its facilities have changed considerably over that time. So has Sandoval, who has worked in public health for more than 14 years and as a dental hygienist for 17. She is also a part-time clinical instructor at the Chemeketa/OIT Dental Hygiene School, and in August 2017 she completed CDHC training and subsequently became Oregon's first professional in that capacity. American Dental Association (ADA) noted that CDHCs are currently working in 21 states. Thirty-two state associations recognize the CDHC program, which began in 2006. Additionally, there are 120 students currently in CDHC training, 275 CDHC graduates, and educational programs are available in all 50 states, many of which, like the one Sandoval completed, are achieved online. Oregon Dental Association describes the CDHCs as front-line dental health workers who have a deep understanding of the communities they serve, a description that fits Sandoval to a T.
"By serving as liaisons between patients, physicians, dentists, community health centers and other social service agencies, CDHCs are able to connect patients to dentists practicing within their communities," ODA Director of Government Affairs Jennifer Lewis-Goff said. What makes the position unique is the cultural aspect; CDHCs are tailored to the communities they serve. Lewis-Goff stressed that candidates are recruited from the same types of communities where they will work, thereby aiming to eliminate language, cultural and other barriers while facilitating trust with their patients. Sandoval's strides within that aim provide optimism in Oregon. Sandoval was born in Mexico. Her family moved to the United States when she was a child, and she learned to speak English at age 10. In addition to her work at CLC, she has volunteered with Head Start programs and worked with farm-worker populations. At the high school learning center, Sandoval imparted to young mothers both the importance of oral health care and hands-on techniques to accomplish it. "If we don't take care of our teeth, our entire body is going to suffer," she said, explaining the woes of bleeding gums, gingivitis, early childhood caries (formerly baby bottle tooth decay) and the holistic importance of oral health to a person's overall well-being. A prop like Alex is fundamental to the CDHC's in-person effectiveness — as is the program's cultural emphasis. Annette Leong from the Oregon Community Foundations Children’s Dental Health Initiative discussing the need for focus on children’s dental care throughout the state, strategies on helping prevent tooth decay from a young age, and how to encourage your kids to brush their teeth. CLICK HERE to watch video. February 2017- The Virginia Garcia School Sealant Program has received a recognition award from the Beaverton School District after being reviewed by the Oregon Health Authority (OHA). The program, which provides oral health screening and sealant services for school aged children, is active in 21 schools. Nineteen of these schools are in the Beaverton School District. 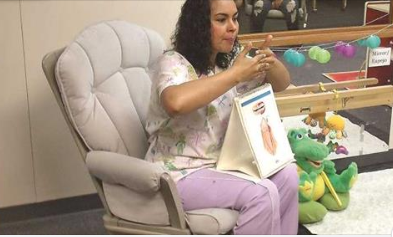 This program was the first program of its kind to be visited and reviewed by the Oregon Health Authority (OHA). Oregon Administrative Rules (OAR333-028-0300) implementing Senate Bill 660 requires OHA to conduct on-site verification reviews of approved school dental sealant programs. The program has received high praise from OHA who called the program “exemplary” in the official review of the program. OHA also recommended in the review that the program consider developing a graphic or dashboard to showcase their work and consider sharing with other programs the use of culturally appropriate educational and outreach materials. Virginia Garcia’s sealant program benefits from collaboration with the Oregon Oral Health Coalition, Centro Cultural and Oral Health America which has provided some outside funding to help build depth to the program in the 21 schools served this year. February 2017- The Northwest Portland Area Indian Health Board (NPAIHB) recently received approval from the Oregon Health Authority to include the Native American Rehabilitation Association (NARA) as a pilot site to demonstrate utilization of culturally competent dental therapists as a part of the dental team. NARA provides dental services to Native Americans representing 259 different tribes as well as Medicaid eligible and uninsured clients in the Portland urban area. Sixty percent of the clients served by NARA’s dental clinic are American Indian (AI) or Alaska Native (AN). Twenty four percent of their patients are uninsured. Even with two full time dentists, a dental hygienist and other current staff, NARA has difficulty servicing the growing demand for dental and oral health care in their footprint. Initial dental therapists will be trained in the successful Alaska program that has been utilizing dental therapists for the last 11 years to serve the Alaska Native people. Since NPAIHB's other pilot sites are very rural, the addition of NARA allows them to expand access to care for the large AI/AN population living in the metro urban area. February 2017- Oregon Health Science University (OHSU) and the Oregon Oral Health Coalition (OrOHC) were recently featured in Geriatric Nursing Journal for their involvement in improving oral health of senior citizens. The study, titled Dental care practices and oral health training for professional caregivers in long-term care facilities: An interdisciplinary approach to address oral health disparities, had two objectives: 1) to assess and analyze the knowledge and attitudes of caregivers towards dental care for older adults in long-term care facilities; and 2) to train administrators, medical staff, and caregivers in the oral health competencies necessary to provide daily oral health care for residents of Assisted Living Communities in Oregon. Dr. Richie Kohli, assistant professor in the Department of Community Dentistry at OHSU was instrumental in compiling the data from both the OHSU and OrOHC projects and preparing the study for publication. The results indicate that OrOHC’s Oral Health for Seniors training curriculum, which provides caregivers with the resource for integrating oral care into basic care of older adults, could improve the health of elderly people and diminish oral health inequities. The aging population continues to grow in Oregon and is sadly underserved when it comes to oral health services. The models demonstrated in the study provide examples that could be implemented on a larger scale by health care delivery organizations. Become a Community Partner with Oregon Health Authority! February 2017 -Oregon Health Authority’s (OHA) Community Partner Outreach Program (CPOP) provides training and ongoing support to Community Partner Application Assisters throughout Oregon. Assisters are skilled at helping Oregonians apply for health coverage like the Oregon Health Plan (OHP) and Qualified Health Plans (QHP) through the Federally Facilitated Marketplace (FFM), HealthCare.gov. Most Assisters work at hospitals, clinics, private practices, Tribal clinics, Federal Qualified Health Centers (FQHCs) and other entities that provide oral, physical and behavioral health services. For more information, contact Colette Gillies at Colette.gillies@state.or.us or 503-932-8601. August 2016 - Capitol Dental and Samaritan Health have joined forces to open several medical-dental co-location projects, including two in Lebanon and one in Sweet Home. Dawn lowe (left) and vanessa maciel (right) are both expanded practice dental hygienists for capitol dental and serve their communities through co-location programs. Vanessa Maciel, an Expanded Practice Dental Hygienist (EPDH), provides dental services at a pediatric clinic in Lebanon. Dawn Lowe, also an EPDH, works at Sweet Home Family Medicine Clinic. “The idea was to provide whole body healthcare by having dental services in the same building as medical services. A dental hygienist is at each location five days a week to provide preventive care like screenings, x-rays, fluoride varnish application, sealants, and cleanings. The hygienist can then schedule patients for treatment with the dentist assigned to that location to get the patient on a regular maintenance program. All services are free to uninsured patients age 19 and up, and to Capitol Dental patients,” said Dawn. Transportation issues, such as traveling to healthcare offices for multiple appointments, are a common concern for patients in that area. “What I find most valuable is having multiple services (mental, medical, and dental) all under one roof to eliminate one barrier for the patient, which is transportation,” said Vanessa. Patients in Brownsville are also seen quarterly, limiting the number of times they would need to drive to Sweet Home or Lebanon for care. As the program became a standard part of the community, many patients were excited to learn that they could receive dental care at the same office they already went to for medical care. “Patients have been beyond grateful for the services and the opportunity to have them. I have had patients with dental phobias but due to the fact that they trust their PCP they are willing to come in and end up being amazed of all they can get through with our help,” commented Vanessa. Finances is another reason patients might put off dental care, but the co-location sites address that as well. "We never charge for any of the services we provide at the co-locations. Services offered include but are not limited to: fillings, extractions, cleanings, periodontal therapy, fluoride application, sealants, screenings, x-rays, oral cancer check, and referrals," said Dawn. Two key demographics for good oral health are pregnant women, who can inadvertently transmit cavity-causing bacteria to their babies, and young children, who are especially susceptible to cavities, also known as “early childhood caries”. “We work closely with the OB patients, educating them about oral health during and after pregnancy to be able to have good oral health and reduce chances of preterm birth and bacterial transmission to baby. We also incorporate dental checkups with a well-child check to catch any early childhood caries and get the child used to a dental setting at an early age,” added Vanessa. Surprisingly, another population has come forward to take advantage of the co-locations’ dental services: seniors. “So many low income seniors live in this area and are on Medicare, which doesn’t cover dental. Many of them have applied for the Oregon Health Plan and have been turned down although they are living paycheck to paycheck. They are so happy and so thankful that they now have a place to get their teeth cleaned regularly and have access to a dentist should they need it,” stated Dawn. The co-location programs are paid for by a federal grant secured by Samaritan Health. This funding helps pay for part of the care provided to uninsured patients. Samaritan provides office space for the hygienists to work; Capitol Dental provides the hygienists, dentists, mobile dental van, and supplies. The partnership has been working for 2 ½ years. There are plans to expand into Lincoln and Polk counties in the future; Capitol and Samaritan’s contract states a total of 10 co-locations will be open within the next few years. Currently, 4 co-location sites are open. June 2016 - Yamhill County hosted its first medical-dental health carnival, Toothtastic Jab-a-palooza, on April 27. The event, which took place at three different medical sites, integrated dental and mental health services and education for families in the region. Physician’s Medical Center of McMinnville, Virgina Garcia of McMinnville, and Sheridan Medical Center participated. Focused on the health of 0-10 year olds, the clinics offered vaccinations and oral health screenings. Sites had been First Tooth trained so staff could provide fluoride varnish, a preventive measure against early childhood caries. Oral health education was also given to parents and children. “The event was a great success,” said Treva Schoof, and RN at Physician’s Medical Center. Her site saw 69 patients in all. 64 of these received oral assessments and fluoride varnish and 23 were vaccinated. 33 patients were seen at Virginia Garcia, where 13 patients received sealants and 15 had fluoride varnish applied. Another 13 patients were seen at Sheridan Medical Center. Families that attended reported that it was fun and beneficial for their children. Congratulations, Yamhill County, on hosting a health carnival for your communities! April 2016 - The Rinehart Clinic has long known that it needed to offer more dental services for the rural community of North Tillamook County. When the opportunity came to join a pilot for Oral Health Integration with Oregon Primary Care Association (OPCA), the Rinehart Clinic jumped at it! The first step was a recent First Tooth training focused on oral health integration into primary care. During one of the planning sessions for Oral Health Integration, staff members discussed organizing a kickoff event. After the First Tooth training, the outreach team started planning the assembly and practicing their skills on family and friends. The team included Denise, RN Care Coordinator, the Clinic Staff Supervisor playing the evil Plaque Fairy, and the Outreach Coordinator who partnered as the Plaque Monster. The Director of Quality played the Tooth Fairy. “We put together a 10-minute skit that focused on healthy eating habits, good oral health, and fluoride varnish protection. It was a prime opportunity to partner with the local grocery store and we invited the Apple mascot from Manzanita Grocery and Deli to join us,” said Keri. On the day of the kick-off event the motley crew of fairies, apple, nurse, and plaque monster enthralled the kids of Nehalem Elementary with the joys of oral health. Each kid went home with a packet containing a clinic brochure, coloring pages, a monthly brushing chart, PlakSmackers, fluoride toothpaste, a sparkly toothbrush, and education materials for the parents. The feedback was fast and furious. The kids were excited, the parents were interested, and the principal was ecstatic. June 2016 - As Oregon’s eight Local Oral Health Coalitions work to improve the oral health status in their communities, new coalitions are in the process of formation. June 7th marked the initial Oral Health Coalition meeting for Douglas County. The event was held as a part of The Douglas County Oral Health Summit, organized by Cindy Shirtcliff from Advantage Dental and Peggy Madison with Douglas Public Health Network. The Douglas County Oral Health Summit began with a presentation by Dr. Jeremy Horst on “A Medical Model to Stop Dental Caries”. With 49 people in attendance, Dr. Horst gave an overview of his successes with silver diamine fluoride. After the presentation by Dr. Horst, Peggy Madison led a conversation on the establishment of an Oral Health Coalition in Douglas County. Over 20 stakeholders who live or work in or around Douglas County came together to discuss the oral health status in Douglas County, areas for the coalition to pursue, and what is already being done in the community. The Oral Health Summit succeeded in bringing together a wide variety of stakeholders who are committed to working collaboratively on oral health issues. Douglas Public Health Network has agreed to sponsor the Coalition as a public health prevention and promotion service to the community, and the group hopes to establish a regular meeting time soon. The Yamhill County, Columbia Gorge Region, South Coast, and Lincoln County Oral Health Coalitions continue to meet on a monthly basis. The Southern Oregon and Benton/Lincoln/Linn Regional Oral Health Coalition meet every other month. April 2016 - Meagan Kintz has been working with the Capitol teledentistry program since its planning stages last year to its implementation, which started in the fall of 2015. The program, which continues into 2016, “keeps me on my toes and is always interesting,” says Meagan. As an expanded practice dental hygienist for Capitol Dental Care, Meagan is no stranger to inspecting smiles. With the teledentistry program, however, “I have the opportunity to provide services (with the help of a dental navigator) to elementary school aged children in the Central School District, specifically kindergartners through second graders,” while they are at school. One goal of the program is to eliminate barriers to dental care such as transportation, wait time for an appointment, missing school, and cost of care. “By starting in kindergarten, we hope to see a reduction in tooth decay by the time the child enters second grade due to services, education, and early intervention.” By serving students at school, dental appointments can also be freed up for patients in need of advanced care. “Utilizing my expanded practice permit, I am able to perform every service a child would have completed at a regular preventive dental appointment, with the exception of seeing a dentist face to face. Each child’s appointment looks a little different based on their age and needs but typically, I do an initial disease or dental assessment, take intraoral photographs, radiographs with a portable x-ray unit, cleanings, sealants as needed and fluoride varnish. After collecting data, I build an electronic chart for each child seen,” says Meagan. By uploading the charts to a cloud-based server, a partnering dentist can review the information in 24-28 hours to decide if the child can stick with preventive care visits or needs to be seen by a dentist. This program is a great fit for Meagan, whose interest in public health was inspired by volunteering to conduct dental screenings in rural communities.